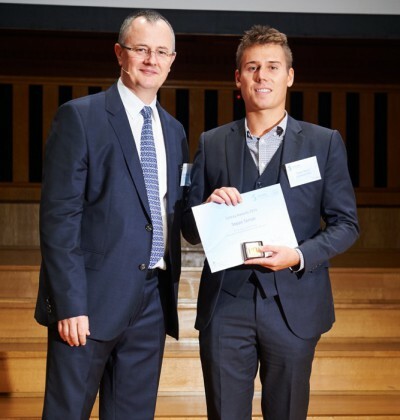 On October 18th, The BruBotics Ph'D student Seppe Terryn was awarded with the Solvay Award for his master's thesis "Development of a self-healing compliant actuator", promoted by Prof.Dr. Dirk Lefeber (Robots & Multibody Mechanics). Seppe is now continuing his work on this exciting topic as a Ph'D student. To stimulate young scientists to communicate science towards non-experts, the Solvay Institutes rewarded 29 exceptional master and PhD students of the VUB and ULB with a Solway award. Based on their outstanding auditional performance in front of a Solvay jury and the quality of their master and PhD dissertations, five master and five PhD students of the VUB (listed below) received a Solvay award by the CEO, Nicolas Cudré-Mauroux. The Solvay Institutes maintain a strong tradition in supporting curiosity-driven scientific research. Among scientists, the Institutes are widely recognized for the organization of the famous Solvay conferences on Physics and Chemistry, which are associated to famous participants such as Einstein, Planck, Bohr, Curie and many others. The Solvay Institutes also highly value the popularization and communication of today’s big scientific problems to the general public.